Thanks! I wasn't sure if the latest pics would do it justice. Looking at the columns, I'm wondering if I should add that stone patterning to the interior walls...? It took a good amount of free time to do the columns but the walls could take a very long time to do, but the end result might be worth it. Thoughts? I think the end result will be worth it, although it will take some time. Can't you use that plate with the pattern, or is there something with that? Well I'm about out of Styrofoam parts. I definitely don't have enough to do the interior walls with it. What I have left will mostly likely be used on the tower. So If I do the interior walls it will be with card strips like the columns. It'll probably be worth it, i agree. My free time has become strained recently, so here's hoping I can still make my December deadline! If you keep going like this there won't be a problem. What do you still have to do? Only the interior walls and the tower right? Affter that you can go and paint it. Castles coming along nicely. 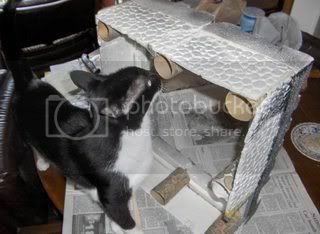 Are you going to add some wood looking supports on the inner walls or similar? I'm hoping to work on it this evening. As far as wood supports, no I wasn't It'll make more sense as you start to see some of the additions I'm going to add to it. I'm going to be fighting a space race with the inner courtyard and I'm trying to keep it as open as possible for accessability reasons. I'm going to be using wood on the tower though. I have a balcony in mind and the doors. 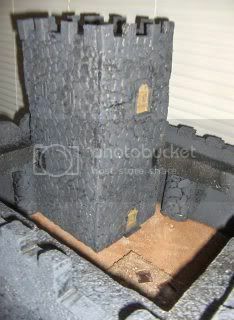 I have a few more holes to plug and gapes to fill, then I will prime the castle black. and begin the base coat. The tower is causing a bit of problem at the moment so I've been holding off while I figure out how to extend the top and add crenelations to it. The reason is because, I got looking at some old family pictures from my time in the UK, and you just can't find ancient towers without a walled roof or not designed for defense. The tower so far, is basically an open roof with no cover (i.e. shoot me!). I'm bothered by this and so I'm working on some solutions. 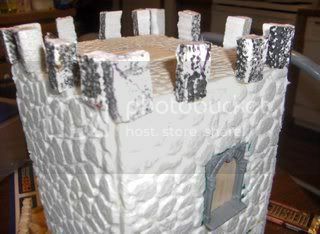 One idea is take the pieces cut out the wall to make the current crenelations and apply them to the tower. I like the continuity in that idea so I'm going to experiment with that. Its local tower to me with a top you might like. That IS cool! That might deserve it's own model though (hint, hint SteveB) It would make a great wizard's tower. Death Castle is slowly starting to come along. I've spent a few evenings filling holes, plugging gapes, filling in cracks and smoothing over seams. Not all of them though, I am wanting the final product to maintain a 'rough' look. 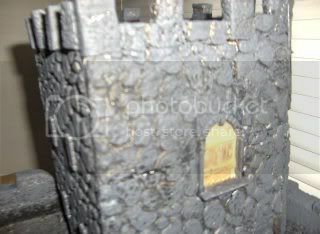 Once that was done, I went ahead and finally spray painted the main body of the castle black. 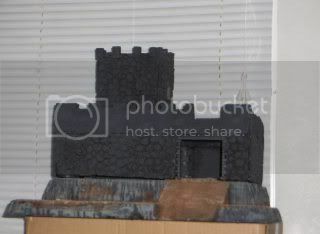 Finally, after 20 years, this Castle has been successfully painted black! I'm sure I mentioned this earlier in the thread, but the paint I used was a floral designers spray paint called Design Masters. You can find it in the U.S. at most Arts & Craft stores or any where that sells fake decorative flowers. 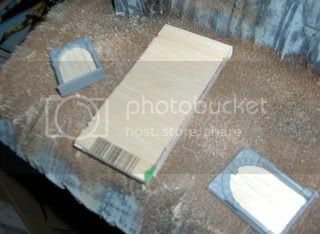 Here's what the can looks like, next to a piece of Styrofoam that had been sprayed with it. This is a Flat Black (gloss will not be good for the additional paint I will be applying). 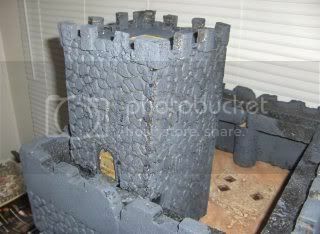 This other pic shows what a blast of normal black spray paint does to Styrofoam (in case the earlier pics of Death Castle didn't reveal enough already). 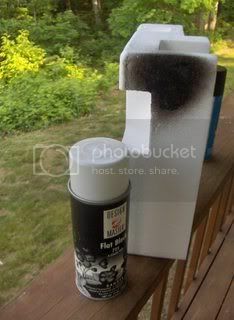 The spray paint used in this example was Krylon. 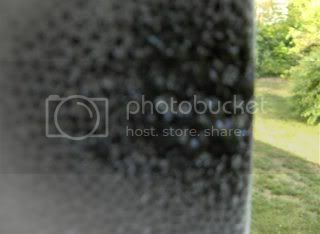 It causes a chemical reaction that burns and bubbles away at the foam leaving very little color and obvious damage. It can be used intentionally however to create battle damage, and looks really good on some of my 40k scenery. Coming up next, I need to tackle the tower. My goal is to have it done by the end of August. I thought my goal of December was overreaching but at this pace, and with my current work load it might be right on! I prefer to refer to it as the, "Standing on an ant hill so I can poke a beehive with a stick" strategy. Progress is slowly being made. 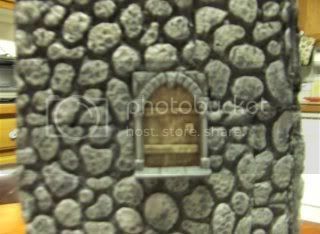 My attempt to find the fortress door sprues ended in futility so I’ve taken the Mordheim doorframes and glued slats of balsa wood to the backside to create a door effect. I’ve not figured out how to make door handles yet but I have some ideas I want to try out. There will be three of these for the tower. One at the base, one for the wall level, and one for the balcony. The balcony itself was fairly easy to construct. I’m currently working out how to mount it into the wall but I’m pretty sure my idea will work. The hand rail for it will take some time to build but it should look nice in the end. 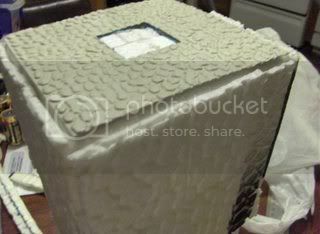 I’ve caped the tower roof with a sheet of molded plastic card with rock embossing. I cut out a square in the center that will represent the hatch opening. This is done although not shown in the picture. Again, I need to work out the handle. 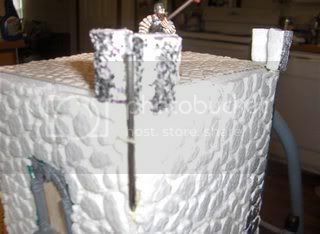 Currently I’m at the point where I will next work on the tower battlements and crenulations. Just don't let your assistant test it too often. Useless as they may be, the horses still need their knights for the extra armour save. The doors have been attached to the tower. This was more difficult than I imagined, but so far the results look good. I still need to figure out how to make handles and hinges but I figure I can work that out bit later. Note that the upper level door will be opening up to a deck/balcony that will be used as a fighting platform. 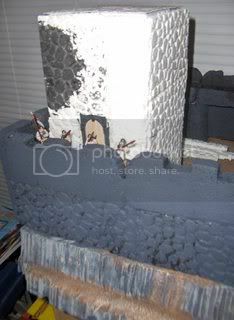 This pic shows how the tower is going to relate to this section of the castle and I put a few models near it to get a vibe of what it all should look like after I complete it. 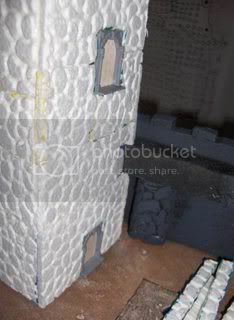 As you can see I’ve base coated the castle walls already. 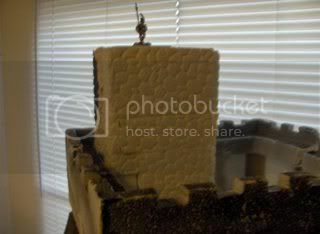 I’m going to take the whole castle up to one more level of painting before I permanently mount it to the base. Back to the tower, I began work on the tower’s crenulations. The main crenulations were made from the pieces originally cut from the walls at the start of this renovation project. As they are only vaguely the same size I’m hoping this unevenness will give the appearance that this castle is old and weathered. 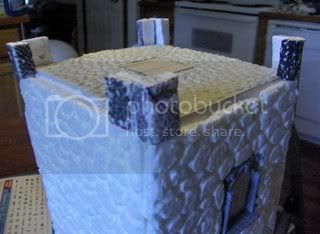 This pic shows the first two corners with a model on the tower’s top to give me a sense of scale. Note that one corner has a metal tube ‘bracketed’ to the tower’s base. This will be a banner holder. Once the project is complete I will make a series of interchangeable banners that can be switched out during play for different occupiers. The metal tube came out of an old Motorolla cell phone (Nextel i90). It’s amazing what kind of cool junk you can get out of old tech devices, but it’s usually more appropriate for 40k instead of fantasy. Here is the tower with all of the main crenulations. In between them will be a short wall that extends the main wall up a bit to provide a tad bit more cover to the men on top. (the strips are on the "ground" of the first two pics of this post) I’ll be adding that on tonight I hope. Again, the unevenness of crenulations will help convey that old worn-torn weathered look that I’m going for. 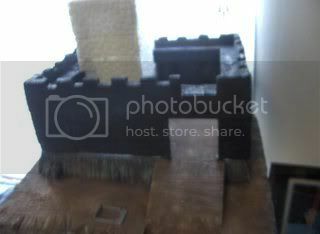 Hopefully when the whole project is down one will think that the castle and tower were always part of the same model. I’m not sure how well it can be seen in this pic but there is now a wooden door in the center of the tower roof. Heh, I've missed a coupl eof updates due to holidays, but this is looking awesome man! I love your doors and the rest of the tower. I don't know how to do the handles, but I think you can just PM steveb, he's built so many things and he's always happy to share his findings, as you may know from other threads. Keep it up! It’s been too long since I updated this, but work has, slowly, progressed on Death Castle. There’s been a lot of drama in and around my life (personal and work) over the past two months that has had a hard impact on my free time. The few moments of peace working on this castle have been quite rewarding. Though I doubt I’ll beat he December deadline, my ultimate goal is to hit a New Year deadline. The first thing you’ll notice, obviously, is that the tower now has paint on it. Sadly, these photos do not do the base coat justice, and the camera flash has the annoying effect of illuminating all the weird little shadow bits in the Styrofoam the paint couldn’t get too, and which cannot be seen in the normal lighting. Never the less, seeing it from the perspective of these photos really helps me get critical with the whole piece; I’m definitely not done with the base coat!!! Also, since last time, I’ve added the arrowslits. These are the ones GW made, and I was wise enough to buy two blisters of them about 8-9 years ago anticipating a project like this one. (Who says hording is bad). It really did take quite a bit of time to fill in all the gapes I could. I was so happy to reach the point when most of them were filled, that I rushed out and sprayed the tower black and didn’t realize I’d left off the arrowslits until I started to basecoat it! It was easy enough to fix though. I think they add a bit of character, and hopefully will be handy in the actual game as well. Doors are proving to be a bit of a challenge. I’m experimenting with painting them now, as you might be able to tell from these photos. I have figured out the solution to my handle dilemma, but I won’t put those on until after the doors are finished. That’s a wrap for now, I hope to update sooner as I get further along with this project in the upcoming weeks. Looks like this project is coming along well! Thanks! * Actually, this is pretty much what I'm going to do. I've already coiled and cut the wires, I'm just waiting to be happy with how the coloring of the doors turns out before I stick'em on. In this photo (sorry, it's a bit blurry but my battery is too dead in the camera to take another pic currently) you can see the "mount" where the handle will go. BTW, I found this method in the 'How to make Wargames Terrain" book by Nigel Stillman that GW put out way back in '96 (I can't believe it's that old now!). A good resource and I prefer it over the current version. 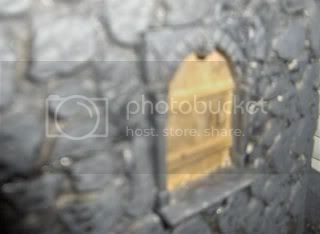 But Steveb, since I've got your attention, what color combinations would you recommend for an old well used, weathered door? My current colors just aren't doing it for me. Using ink on balsa wood has proved to be an error (it just soaks it up like a sponge, even with a light paint undercoat!). Great progress, great job. Only 55 days to go! Great job so far, it's looking amazing. Nice! Keep it up man, you can do it! looks awesome mate, very well done! "Surgere iste terra" - Stand your ground! PART 11: Return to Death Castle! Yes, after too many months of neglect, and admittedly, modeler’s block, two nights ago I returned to Death Castle. Right before Thanksgiving, I returned to 40k in a big way, and my Orks required, and still do, a lot of attention. My schedule is tough and things that require ‘a lot of attention’ taxes heavily on what little free time I have to devote to any of my modeling projects. However, with spring fast approaching I forced myself to let the boyz wait for a while and complete this project. I may have missed my deadline, but I’d rather do this right and be ultimately satisfied than just hack my way through to a finish line. When I last worked on this project, I was hung up on the way the castle walls have settled in such a way that mounting it to the base will become a major undertaking. I have figured out a way around that though, so when the time comes to do that part of the project, I shouldn’t have too many worries. I started right where I left off, continuing to concentrate on the tower. Upon returning to it, I decided that I hated the coloring on the doors and took a new approach. I based coated them brown and worked up a few highlights in various tan colors using mostly a dry brushing technique. Finally satisfied with that, I approached the stones. 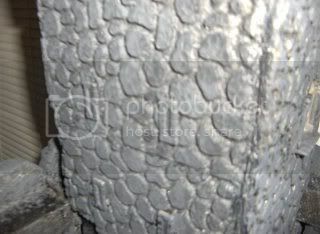 As you can see in the first photo, another layer of base coat was required. 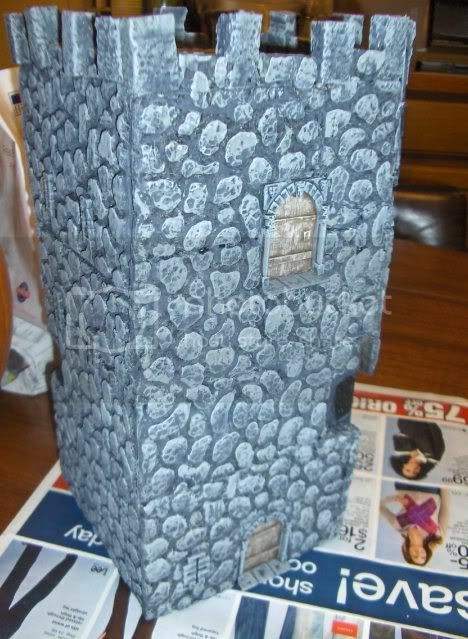 The paints I used on the stones was Americana Graphite by DecoArt (base coat), AppleBarrel Colors Pewter Grey, and for the high light color I used Citadel Fortress Grey. Some stones are painted lighter than other others, and some darker, for a more realistic look. 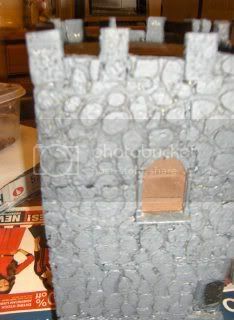 I’m going to go back and apply washes to a few odd stones, such as brown or terra cotta, to get an even more varied look. I still need to highlight the stones on the roof and add the door handles before I tackle the balcony, which is still only halfway done, before the tower is done. I intend to get a lot more done on this soon.